The SkySight Technologies Littoral, Deployable, Modular, Sensor (LDMS) System, designed for the Maritime Expeditionary Security Force, uses an innovative modular mooring approach that utilizes multiple small, lightweight, and easily handled components within the system. The largest component weighs only 45 pounds and is 34 inches long. 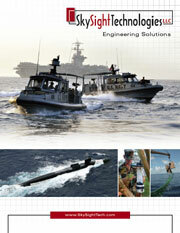 This easily permits deployment and recovery by a single person from a small surface craft. Once deployed, the proposed system can remain in service for a period of one week. In addition, with a weekly battery refresh it can remain on station for up to 6 months. Ruggedized traditional DIFAR sonobuoy directional and omni passive sensors are utilized to keep the costs low and the interface familiar. No other sensor system is available to provide persistent directional and omni acoustic data in a constant moored location. The LDMS is cost effective and has been demonstrated and delivered for fleet use in an ocean environment. The current LDMS system uses standard sonobuoy VHS communications. It can be further upgraded to use satellite communications, which would enable over-the-horizon communications from any location. This makes the system able to respond to threats further from shore. Using the LDMS system or a derivative of the system, operators of data fusion and tracking systems can employ a persistent and moored system that provides continuous acoustic data acquisition in littoral conditions using a familiar user interface with proven sensors at a lower system cost. Any defense and/or homeland security need requiring a rapidly deployable barrier or trip line of acoustic sensor protection could use the LDMS or a variation of the system. Department of Defense (DoD), Department of Homeland Security (DHS), and other government and commercial applications. multiple unique Phase II SBIR programs. To date, 5 DoD Phase III SBIR commercialization contracts have been successfully delivered. © Copyright 2019 SkySight Technologies LLC. All rights reserved.